Samsung has started running the official version of its Android Oreo of its Experience 9.0 multilayer form. Last year's flagship, Samsung Galaxy S8 and S8 +, were the first smartphone brands that received this update. Now the software hit the Galaxy S7 in Vietnam, which is pretty unbelievable. 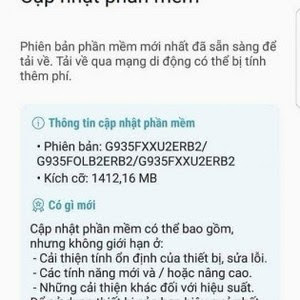 This upgrade to the Samsung Galaxy S7 Edge with the model number G935F, as we can see on the screen above (in Vietnamese), weighs 1.4 GB and should come with a huge changelog. To get a sample of this new software, YouTube has released a video showing Samsung Experience 9.0.